Color/Appearance: Amazon Rosewood tends to be an orange or reddish brown, with darker contrasting streaks. Lighter yellowish sapwood is clearly demarcated from heartwood. 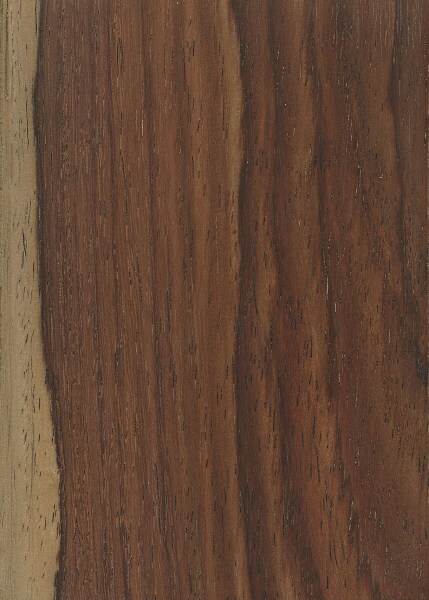 Overall, Amazon Rosewood bears a close resemblance to Brazilian Rosewood, both on the facegrain and also the endgrain. 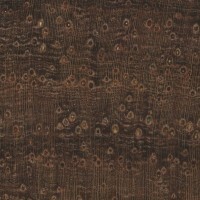 Grain/Texture: Amazon Rosewood has uniform, medium texture with open pores. 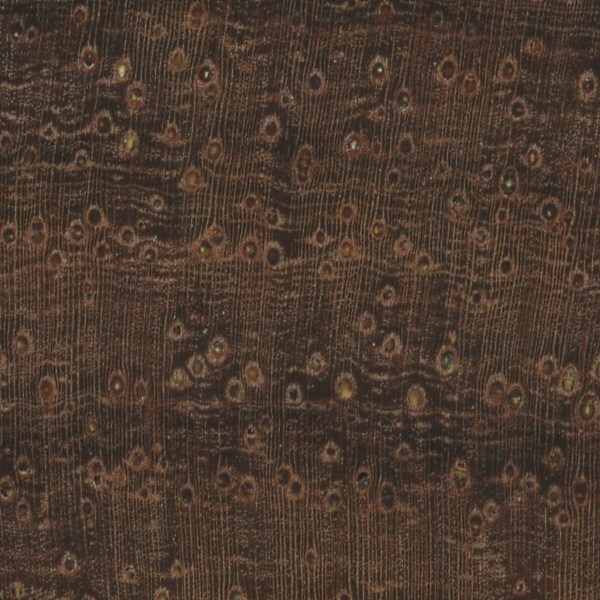 Endgrain: Diffuse-porous; large to very large pores in no specific arrangement; solitary and radial multiples of 2-3; heartwood deposits present (both amber and dark brown); narrow rays not visible without lens spacing fairly close; parenchyma diffuse-in-aggregates, banded, vasicentric, unilateral, and aliform. Rot Resistance: No data available, though being a dense rosewood, it’s most likely very durable. Workability: Amazon Rosewood can be fairly difficult to work on account of its density, which is very close to that of Cocobolo. (It also needs to be glued with care—as do most other true rosewoods.) 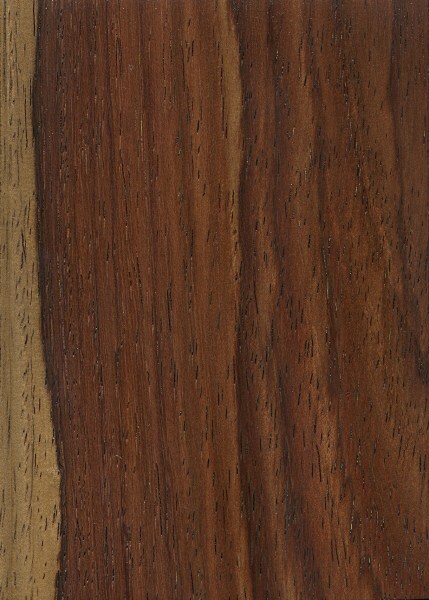 Amazon Rosewood turns and finishes well, and can be polished to a high natural luster. 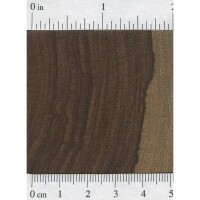 Odor: Amazon Rosewood has a distinct, rosewood-like scent while being worked. Pricing/Availability: Likely to be very expensive; although not listed on any CITES appendices as being an endangered species, Amazon Rosewood is a rare wood and supplies are likely to be very limited. It is most often sold either as thin craft wood, (usually with dimensions suitable for guitar-building), or as turning stock. Sustainability: Although Amazon Rosewood is not evaluated on the IUCN Red List of Threatened Species, it is listed on CITES appendix II under the genus-wide restriction on all Dalbergia species—which also includes finished products made of the wood. Common Uses: Knife scales, guitars (back/sides), pens, and other small turned objects. Comments: Amazon Rosewood is perhaps the closest replacement (visually) to the endangered and highly restricted Brazilian Rosewood. Yet because Amazon Rosewood’s dried weight (on average) exceeds 1,000 kg/m3—the weight of water—one of the simplest ways to distinguish between the two species is by a float test: Brazilian Rosewood (assuming it is dried to at least 12% EMC) will almost always float, whereas Amazon Rosewood will usually sink. Sometimes Macacauba (Platymiscium spp.) is also sold occasionally under the name “Amazon Rosewood,” so care must be taken to ensure purchasing the correct species.